THE RAFALE ISSUE has been kept on the boil with a string of allegations about the Rs59,000-crore deal. Over the past few days, the Narendra Modi government has been furiously firefighting to debunk each allegation. The jury is still out on whether the charges will stick, legally or politically. But what is striking is the ferocity with which Congress president Rahul Gandhi is building up the issue ahead of the Lok Sabha polls. In politics, it is perception that matters. The Narendra Modi government claims that it is fighting the perception battle. Both sides—the BJP and the Congress—have been trying to outdo each other in hurling corruption allegations. This means the Lok Sabha elections will be bitterly fought, with the Congress building a narrative around its mantra chowkidar chor hai (the guard is a thief), and the BJP painting the Gandhi family as the country’s bane. The Congress’s strategy is to step up the pressure till Rafale becomes a Bofors moment for the Modi government. The government, in turn, has been trying to strengthen the cases against the Gandhi family. Investigating agencies recently summoned Congress general secretary Priyanka Gandhi’s husband, Robert Vadra, and his mother for questioning. Also, the purported revelations by Christian Michel, the alleged middleman in the scrapped AgustaWestland chopper deal, are likely to be made public as part of the charge-sheet, which may again be used to show the Gandhis in a bad light. The Supreme Court judgment on Rafale strengthened the government’s position. But, if the court decides to review its verdict based on the revelations that are tumbling out, the government may find the going tough. Rahul cast the biggest stone recently when he accused Modi of treason, saying Anil Ambani of Reliance Defence allegedly knew about the Rafale deal beforehand. “Even the Supreme Court judgment [on the deal] is open to review,” Gandhi said at the Congress headquarters in Delhi, as his party colleagues disrupted proceedings in Parliament. 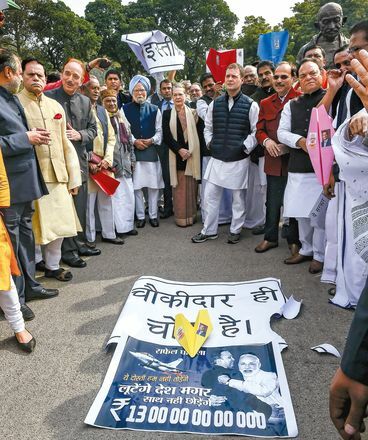 Interestingly, others in the opposition have been silent, or have made only perfunctory statements on the Rafale issue. The Congress’s efforts to bring other parties on board have not yielded much results, as they doubt whether the alleged irregularities in the deal would find resonance with the people. Rahul, however, has single-handedly made Rafale, along with farm distress and unemployment, the Congress’s central poll plank. Party sources say the corruption allegations against Modi would take the halo away from him—a strategy adopted by the BJP against prime minister Manmohan Singh in the 2014 elections. The Congress has been holding media conferences across the country, while Rahul has made Rafale a leitmotif of his speeches. The party has also been demanding an inquiry by a joint parliamentary committee into the deal’s alleged irregularities. It has spun a narrative on Rafale that cuts through the technical details to make it resonate with the public. The ‘chowkidar chor hai’ slogan, which is central to the narrative, conveys that Modi, who had promised not to allow any corruption in the country, was personally involved in changing the contours of the Rafale deal to benefit Anil Ambani, who was awarded offsets worth Rs30,000 crore. The government, however, has been stonewalling demands for a JPC probe. The Supreme Court judgment on the issue, which said there was nothing objectionable about the deal, has strengthened the government’s position. But, if the court decides to review its verdict based on the revelations that are tumbling out, the government may find the going tough. But for now, the BJP strategy has been to contest each of Rahul’s claims on the Rafale controversy. It is also projecting Modi’s clean image and humble origins, which the party hopes will resonate with the people. Modi and BJP president Amit Shah, as usual, are attacking the Gandhi family for the scams that happened under their watch. While Modi assures people that the chowkidar continues to be alert, Union ministers have been tasked to hold media conferences across the country to counter the Congress’s claims. The much-awaited report of the Comptroller and Auditor General, tabled on the last day of the budget session of Parliament, served only to prolong the slugfest between the two sides. Citing the report’s findings, the government said it stood vindicated. “Satyameva jayate (The truth shall prevail). The CAG report on Rafale reaffirms the dictum,” tweeted Union Minister Arun Jaitley. The Congress rejected the report saying it had been authored by the government. “Did the Supreme Court have access to the dissent recorded by three negotiators of the [Indian] negotiating team? This is a government paper,” said Rahul.